This post could as easily be titled "What I've Been Doing the Past Two Months." Ever since I started TodaysCatholicHomeschooling.com a few years ago, I've wanted to put together a print resource guide. 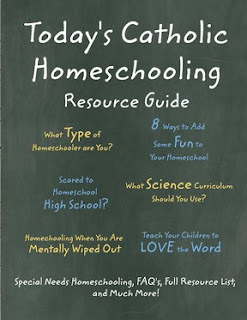 There hasn't really been much out there for Catholic homeschoolers other than publications put out by particular curriculum providers. 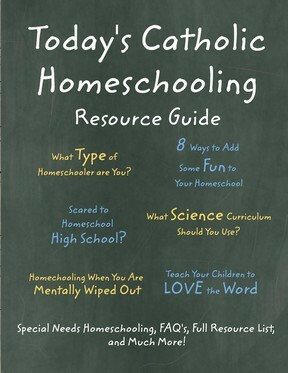 I wanted something that could benefit all Catholic homeschoolers, regardless of their educational philosophy. I finally committed to the project at the end of March, set a crazy deadline of the end of May, hired a friend to sell advertising, recruited the writers (there are 40 articles), and then formatted the whole thing all in two months! Since my workday starts after my daughter goes to bed (around 8:00 pm), this has meant a lot of late nights. I'm pleased with the finished project and hope people find it of benefit. What Do You Want From Your Doctor? What do you want from your doctor? In this age of managed care and exorbitant health costs, it can seem like an almost futile question. I know I’ve often had to pick a doctor at random from the list that our insurance company provides and hope for the best, or a sick visit means going to the local walk-in clinic and getting whoever happens to be on duty. In both instances, I’ve had both good and bad experiences. Dr. Jean Golden-Tevald, D.O. invites us to consider that initial question in her new book, Hopeand Healing: Ultimately What You Need From Your Doctor. She is the older sister of one of my close friends, has been a family physician for twenty-five years, and has special training in women’s health and NaProTechnology and the Creighton Model Fertility Care System. While she is in New Jersey and I am in Massachusetts I had the occasion to seek her services due to some reproductive health issues I was having last year and due to my religious beliefs, I felt extremely frustrated with my local doctor. She was willing to see me via a video-call and coordinated my care long-distance. Truly, it was some of the best care I have ever received. I felt heard and understood. It is from that vantage point that I review her book. I can vouch for the fact that Dr. Golden-Tevald practices what she preaches. She acknowledges that healing may not always involve a cure. She works with many couples experiencing infertility. While some couples do ultimately conceive a child, others do not. She offers examples of cases where there was an emotional healing while not a physical one. She also emphasizes the need for patients to be honest and for women to value ourselves enough to feel that the cost is worth it to care for ourselves. We so often care for everyone else to our own physical and emotional detriment. 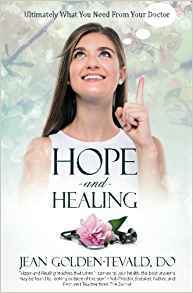 Hope and Healing is a book worth reading. I wish that there were more doctors who shared Dr. Golden-Tevald’s philosophy in the world. I would recommend it especially to those in the medical profession because it offers a different example of what health care can look like. I've been honored to be a judge for the ACP awards in the Children's category for the past few years. Here is press release on all the winners. The Association of Catholic Publishers (ACP) is pleased to announce the winners of the 2017 Excellence in Publishing Awards which recognize the best in Catholic publishing. The 2017 “Book of the Year” is Dear Pope Francis: The Pope Answers Letters from Children Around the World from Loyola Press, currently #24 in Christian Children’s Books at Amazon. “The questions are both thought-provoking and interesting, and Pope Francis illustrates his respect and care for children in his answers,” commented one of the judges. The “Book of the Year” is selected from among the first-place finishers. Ave Maria Press and Liturgical Press tied with 5 total awards each. A total of 12 different publishers received honors. Ave Maria Press received 2 first place awards, and Liturgical Press had 1. Books from 14 different publishers were represented across the 11 categories. The reading public also recognizes the quality of these titles through their purchasing patterns as measured by Amazon. Of the 31 awardees, 17 are in the top 1000 sales of an Amazon book subcategory. Of those, 13 are in the top 500, and of those, 6 are in the top 100, led by A Single Bead from Pauline Books and Media at #9 in Teen books (Emotions & Feelings). The following titles are the 2017 winners of the “Excellence in Publishing Awards” by category. Our world seems designed to distract us from God. Stillness and silence are rare commodities. And the constant demand of families, home, and career combine with the relentless ding of our cell phones and never ending sea of noise emanating from our televisions, computers, cars, and office speakers. A noisy world can lead to a starving soul. Creating a rhythm of life in which we regularly pause to meet with God can root us and reorient us to what truly matters. Praying the divine office can help us create sacred space in a shouting world. The early church met for prayer at set times during the day. Early church fathers carried on the tradition. Also known as the liturgy of the hours, today we continue this ancient practice through praying the divine office, which combines readings from the Psalms and other passages of Scripture along with hymns, prayers, and thoughts of the church Fathers or spiritual masters. By using a printed or online breviary, praying the divine office helps us join our voices in unison with believers around the world. Praying the divine office reminds us that all time is God’s time. Developing a rhythm of daily prayer helps us practice the sacred art of being fully present. Instead of rushing from one activity and appointment to the next, we pause to inhabit our present, being fully attentive to what God is doing right now in this moment. Praying the office helps us create a private sanctuary of sacred space, slowing the frenetic pace of our lives. Laying aside the urgent to celebrate the eternal reminds us that all our moments belong to God, helping us being a better steward of our time. Praying the divine office helps us join with the voice of the Bride. As we pray the divine office, we are joining our voice with the voice of priests and faithful around the world. As Church, through the divine office we speak with as the voice of the Bride. There is something special about knowing when I pause to pray, my prayers are echoed in the prayers of believers around the globe. It is a sacred privilege to participate in the united prayer of the Church and a duty which we should not neglect. Praying the divine office creates space for our souls to speak. Often in prayer I do not have the words to speak the longings of my soul. But the Psalms express the cries of my heart. Praying the Psalms allows us to express the full gamut of our emotions; joy and pain, confidence and doubt, and hope and sorrow are all contained within the pages of the Psalms. Praying the divine office gives me words when I have none, creating space for my soul to speak. When my world gets chaotic, praying the divine office is a lifeline which tethers me to the eternal. It reminds me that all my time is God’s time. It helps me join with the voice of the Church across the globe, and gives me words to express the cry of my soul. As I pray the divine office, I find my steps in the rhythm of grace. How have you made the divine office part of your life? Kelly Scott is a an avid traveler, Christian, writer, and dog lover. Professionally, she enjoys writing on various topics including the following : Christianity, business, digital marketing, and seo. When she is not working, she enjoys spending time with family, friends, and her silly dog Lucy. World Day of Prayer for Vocations will be observed on Sunday, May 7th, also known as "Good Shepherd Sunday." The purpose of this day is to publicly fulfill the Lord's instruction to, "Pray the Lord of the harvest to send laborers into his harvest" (Mt 9:38; Lk 10:2). Please pray that young men and women hear and respond generously to the Lord's call to the priesthood, diaconate, religious life, societies of apostolic life or secular institutes. You can find many resources to promote a culture of vocations on the USCCB Vocations webpage (www.usccb.org/vocations).